Donate to NC Disaster Relief Fund. CERT educates individuals about disaster preparedness for hazards that may impact their area and trains them in basic disaster response skills, such as fire safety, light search and rescue, team organization, and disaster medical operations. 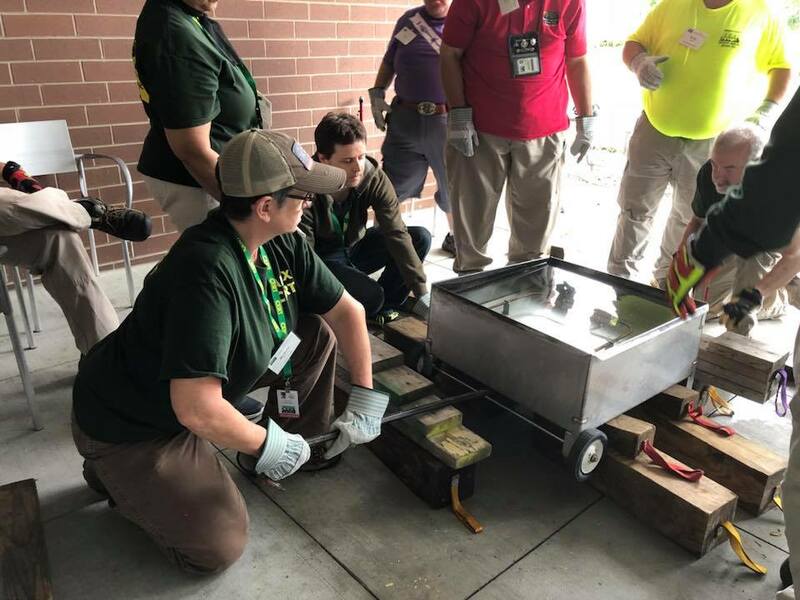 Using training learned in the classroom and during exercises, CERT volunteers can assist others in their community following a disaster when professional responders are nor immediately available to help. CERT volunteers are also encourages to support emergency response agencies by taking an active role in emergency preparedness projects. Emergency personnel are trained to handle all kinds of disasters, but they may not be immediately available in a catastrophic disaster. In such situations, members of the community may be on their own for several days or longer. They may have to rely on their own resources for food, water, medical care, etc. Simple Triage and Rapid Treatment (START) is a critical concept for initially dealing with casualties in a disaster. History has proven that 40% of disaster victims can be saved with simple and rapid care. This unit focuses on the three components of an effective search-and-rescue operation - sizeup, search, and rescue - and the methods and techniques that rescuers can use to locate and safely remove survivors. The Incident Command System (ICS) is used by emergency response agencies to manage emergency operations. When CERTs activate, they become part of that system. ICS is also used for day-to-day operations. CERT members might see and hear things during a disaster that are unpleasant, uncomfortable, and upsetting. They must prepare themselves for their response role by learning about the possible impacts of disasters on themselves and others, emotionally as well as physically. More information available on the website for the NC CERT Program. Alleghany Interested in starting a CERT in Alleghany County? Contact the State CERT Office today! Anson Interested in starting a CERT in Anson County? Contact the State CERT Office today! Ashe Interested in starting a CERT in Ashe County? Contact the State CERT Office today! Avery Interested in starting a CERT in Avery County? Contact the State CERT Office today! Bladen Interested in starting a CERT in Bladen County? Contact the State CERT Office today! Brunswick Interested in starting a CERT in Brunswick County? Contact the State CERT Office today! Buncombe Interested in starting a CERT in Buncombe County? Contact the State CERT Office today! Burke Interested in starting a CERT in Burke County? Contact the State CERT Office today! Caswell Interested in starting a CERT in Caswell County? Contact the State CERT Office today! Catawba Interested in starting a CERT in Catawba County? Contact the State CERT Office today! Cherokee Interested in starting a CERT in Cherokee County? Contact the State CERT Office today! Clay Interested in starting a CERT in Clay County? Contact the State CERT Office today! Cleveland Interested in starting a CERT in Cleveland County? Contact the State CERT Office today! Davidson Interested in starting a CERT in Davidson County? Contact the State CERT Office today! Davie Interested in starting a CERT in Davie County? Contact the State CERT Office today! Duplin Interested in starting a CERT in Duplin County? Contact the State CERT Office today! Eastern Band of Cherokee Indians Interested in starting a CERT in EBCI? Contact the State CERT Office today! Edgecombe Interested in starting a CERT in Edgecombe County? Contact the State CERT Office today! Gaston Interested in starting a CERT in Gaston County? Contact the State CERT Office today! Graham Interested in starting a CERT in Graham County? Contact the State CERT Office today! Granville Interested in starting a CERT in Granville County? Contact the State CERT Office today! Greene Interested in starting a CERT in Greene County? Contact the State CERT Office today! Harnett Interested in starting a CERT in Harnett County? Contact the State CERT Office today! Haywood Interested in starting a CERT in Haywood County? Contact the State CERT Office today! Henderson Interested in starting a CERT in Henderson County? Contact the State CERT Office today! Hertford Interested in starting a CERT in Hertford County? Contact the State CERT Office today! Hyde Interested in starting a CERT in Hyde County? Contact the State CERT Office today! Iredell Interested in starting a CERT in Iredell County? Contact the State CERT Office today! Jackson Interested in starting a CERT in Jackson County? Contact the State CERT Office today! Lenoir Interested in starting a CERT in Lenoir County? Contact the State CERT Office today! Lincoln Interested in starting a CERT in Lincoln County? Contact the State CERT Office today! Macon Interested in starting a CERT in Macon County? Contact the State CERT Office today! Madison Interested in starting a CERT in Madison County? Contact the State CERT Office today! Mitchell Interested in starting a CERT in Mitchell County? Contact the State CERT Office today! Montgomery Interested in starting a CERT in Montgomery County? Contact the State CERT Office today! Moore Interested in starting a CERT in Moore County? Contact the State CERT Office today! Nash Interested in starting a CERT in Nash County? Contact the State CERT Office today! Northampton Interested in starting a CERT in Northampton County? Contact the State CERT Office today! Onslow Interested in starting a CERT in Onslow County? Contact the State CERT Office today! Pamlico Interested in starting a CERT in Pamlico County? Contact the State CERT Office today! Pasquotank Interested in starting a CERT in Pasquotank County? Contact the State CERT Office today! Person Interested in starting a CERT in Person County? Contact the State CERT Office today! Pitt Interested in starting a CERT in Pitt County? Contact the State CERT Office today! Polk Interested in starting a CERT in Polk County? Contact the State CERT Office today! Richmond Interested in starting a CERT in Richmond County? Contact the State CERT Office today! Rutherford Interested in starting a CERT in Rutherford County? Contact the State CERT Office today! Sampson Interested in starting a CERT in Sampson County? Contact the State CERT Office today! Scotland Interested in starting a CERT in Scotland County? Contact the State CERT Office today! Stanly Interested in starting a CERT in Stanly County? Contact the State CERT Office today! Stokes Interested in starting a CERT in Stokes County? Contact the State CERT Office today! Surry Interested in starting a CERT in Surry County? Contact the State CERT Office today! Swain Interested in starting a CERT in Swain County? Contact the State CERT Office today! Transylvania Interested in starting a CERT in Transylvania County? Contact the State CERT Office today! Tyrrell Interested in starting a CERT in Tyrrell County? Contact the State CERT Office today! Union Interested in starting a CERT in Union County? Contact the State CERT Office today! Vance Interested in starting a CERT in Vance County? Contact the State CERT Office today! Warren Interested in starting a CERT in Warren County? Contact the State CERT Office today! Watauga Interested in starting a CERT in Watauga County? Contact the State CERT Office today! Wayne Interested in starting a CERT in Wayne County? Contact the State CERT Office today! Wilkes Interested in starting a CERT in Wilkes County? Contact the State CERT Office today! Wilson Interested in starting a CERT in Wilson County? Contact the State CERT Office today! Yadkin Interested in starting a CERT in Yadkin County? Contact the State CERT Office today! Yancey Interested in starting a CERT in Yancey County? Contact the State CERT Office today!